Sussex are favourites to claim their third win in four Specsavers County Championship games after an unbeaten 166 by Stiaan van Zyl left Leicestershire reeling at Arundel. 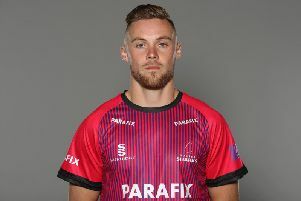 The South African was well supported by Luke Wright and Ben Brown, who both made half-centuries, before a violent cameo by Jofra Archer, who smashed 42 off 14 balls, took Sussex to 443 for 6 declared, leaving Leicestershire needing 425 to win their first game of the season. Their openers Arun Harinath and Paul Horton got through ten overs before stumps to close on 36-0, needing 389 for victory on the final day. Afterwards van Zyl said: "I've been hitting the ball really well recently so I'm chuffed to have made a big contribution both for myself and the team. "There were stages when it was really tough. The wicket hasn't deteriorated that much but bowlers who can put it in the right areas can give you a problem, but as a left-hander I wasn't really troubled by their off-spinner (Rob Sayer) landing it in the rough and once I'd got in I felt in control. "I was aware how close I was to my career-best 172 but I also knew when we would declare. It would have been nice to get a couple of wickets before the close there but hopefully our bowlers can do the job tomorrow for us. I think our two spinners, Danny Briggs and Will Beer, could have a big part to play." Van Zyl had come to the wicket when Sussex’s advantage was only 64 after Luke Wells (43) was lbw to Matt Pillans. Harry Finch, trapped in his crease by Clint McKay, went for 18 with only four more runs added and Sussex 87 for 4, but Leicestershire’s day went downhill from there. Van Zyl gave one chance on 35 which should have been taken, but Richard Jones dropped an easy catch at cover off Will Fazakerley’s first ball and the 29-year-old, who played 12 Tests before joining Sussex on a three-year Kolpak deal in the winter, made them pay. He did the hard yards in assessing the vagaries of a pitch offering some erratic bounce and then began to drive confidently through the off side, collecting the majority of his 24 boundaries between cover and mid-off. His stand of 135 in 40 overs with Wright, who hit eight fours in his 110-ball 60, put Sussex in the driving seat and there was no loss of momentum when Wright hooked to deep square leg. Skipper Brown was at his busy and effective best, turning ones into twos and employing some effective back-foot shots against a tiring attack. There was some rough for Leicestershire’s three spinners to work with but none made much of an impression as Brown and van Zyl added 146 in 28 overs to build a strong position. Van Zyl passed his previous best for Sussex – 147 against Durham in May – and although Brown was pinned in front by a shooter from Richard Jones after scoring 67 in 80 balls with eight boundaries there was no end to the suffering for Leicestershire’s foot-sore attack, who have failed to bowl a side out twice in the Championship this season. Archer thrashed off-spinner Rob Sayer for three sixes in an over before hoisting Fazakerley over long leg. He also struck three boundaries in a violent cameo before Sussex pulled out with van Zyl on 166 from 252 balls with 24 fours. Batting for over five hours in the energy-sapping heat was as impressive a statistic.